On Friday, Vice President Mike Pence is set to depart on a trip to Egypt, Jordan, and Israel, to support the Trump administration’s efforts in pursuit of an “ultimate deal” to bring about Middle East peace. In the long history of foreign trips by senior U.S. officials, I am hard pressed to find one that is likely to be more counterproductive than this visit. Pence should cancel. After President Donald Trump’s decision early last month to recognize Jerusalem as Israel’s capital, White House officials acknowledged that the Palestinians would need a “cooling off period” before they could return to constructive discussions. But instead of waiting patiently for the Palestinians to cool off, the administration is throwing gasoline on the fire instead. Pence’s planned visit is just the latest in a series of escalatory steps. First, Pence announced that he would be visiting more than a month ago, leading Palestinian President Mahmoud Abbas to declare that he would not meet with the vice president. Pence’s office responded with a combative statement accusing the Palestinians of missing another opportunity to pursue peace. Since then, the Trump administration has continued to pour it on. Trump tweeted out a threat to cut off aid to the Palestinians if they did not re-engage in negotiations. Nicki Haley, the U.S. ambassador to the U.N., is holding up American contributions to the U.N. Relief and Works Agency, which provides support for all kinds of programs for Palestinian refugees, unless the Palestinians agree to resume negotiations. The Palestinian reaction has not been good. Earlier this week, Abbas gave an unhinged speech denying any Jewish connect to Israel and making clear he will not negotiate with Trump. It is now quite clear that no negotiations are happening anytime soon, and possibly never again with Abbas. Meanwhile, right-wingers in Israel see this as an opportunity to put a nail in the coffin of the two-state solution by pushing for legislation to annex parts of the West Bank or creating political hurdles that will make it impossible for any future government to negotiate on the final status of Jerusalem. In the past, such initiatives have been restrained because Israeli politicians understood they could lead to unnecessary tensions with the United States. But in this environment there is a view in Israel that the United States is willing to offer a blank check of support for even the most provocative actions, so long as Abbas and Trump remain so publicly estranged. Into this environment steps Pence — the worst of all Trump administration officials to send to Israel at such a time. Pence is the official most associated with Trump’s decision to recognize Jerusalem as Israel’s capital, because the move was largely viewed as a nod to Trump’s evangelical base, which cares deeply about this issue. Pence is very close to this community and is often seen as its chief advocate in the Trump administration. Indeed, Pence was the only other official on screen when Trump announced the Jerusalem move, standing quietly behind the president. It is not surprising that Palestinians are refusing to meet with him. To make matters worse, Pence is planning to go to the Western Wall — the holiest site in Judaism, but also one that is very important to Muslims and highly contested. Choosing to go to the single most sensitive spot in Jerusalem, little more than a month after Trump ignited a firestorm over the city’s status, is unnecessarily provocative. Fortunately, thus far, the decision to recognize Jerusalem as Israel’s capital has not led to a violent explosion. But why risk it with such a high-profile visit? And Pence will also be speaking at Israel’s parliament — the Knesset — where he is likely to make the type of statements that only further feed and encourage the politicians who are already pushing for legislative action that will eliminate the possibility of the two-state solution. The visual of him giving a speech to the Knesset even as he meets with no Palestinian officials will not play well in the Arab world or pretty much anywhere outside of Israel. The visit will also be problematic in other ways. One of Pence’s top priorities on this trip had been to engage with Christian communities in the Middle East. But key Christian leaders in Egypt will not meet with him because of their opposition to the Jerusalem announcement. And Pence’s request to visit Bethlehem and tour the Church of the Nativity has also been denied by religious leaders. How embarrassing for the vice president of the United States. It is hard to remember a similar precedent. The visit will also put President Abdel Fattah al-Sisi of Egypt and King Abdullah II of Jordan in a delicate spot. Pence is going to those countries first. Their leaders will not know precisely what he plans to say and do in Israel and they certainly do not want to spurn the vice president. 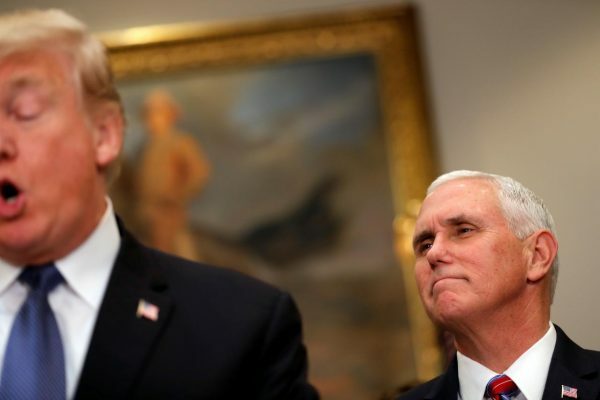 But they also will not want to be publicly associated with Pence only days before a highly controversial trip to Israel and a major diplomatic confrontation with the Palestinians. This is especially true of King Abdullah, given that an estimated 70 percent of Jordan’s population is Palestinian. So, most likely we will see only muted joint media appearances and photo opportunities with very short statements, or possibly even no statements at all. Do not expect the usual red carpet treatment that would typically befit a vice presidential visit. The bottom line is that there is simply no pressing reason for Pence to travel to the Middle East this weekend. The possible downsides are significant and there is little positive that he can accomplish outside of further inflaming an already bad situation. He should stay home. That’s why Israel apologised to King Hussein.. haha.. what kind of world are we living in..
Pence is not visiting the Middle East in pursuit of an “ultimate deal” to bring about Middle East peace. Pence is planning to go to the Western Wall – tells it all.